It’s 2018, Every Hotel needs a website however, being a hotel owner, one might not know what is best for their online audience, so we bring you the 5 Best Free WordPress Themes for Hotels. These are all fully responsive with a beautiful yet stylish design. 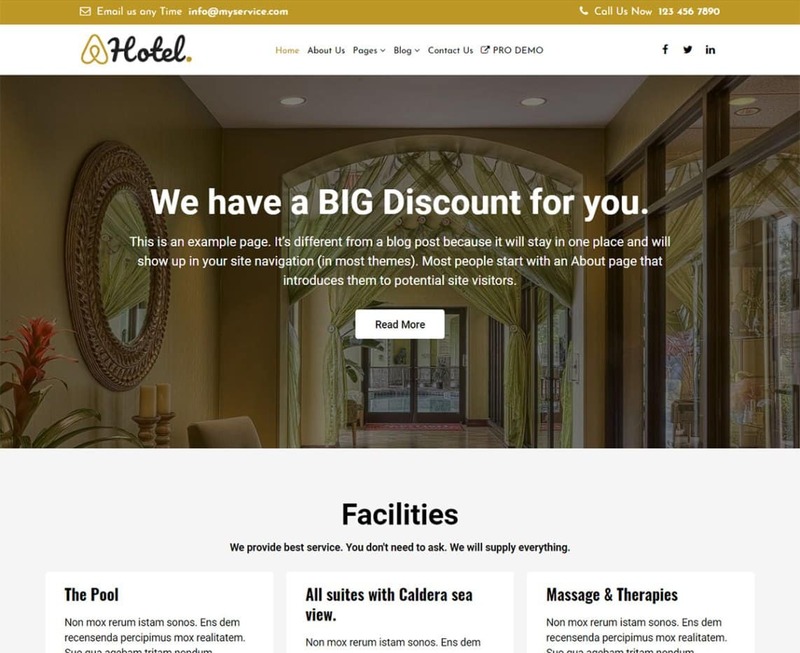 Hotel Resort WordPress Theme is designed for resort, hotel, motel, hostel, lodge, inn, bed and breakfast, holiday homes, accommodation, and room reservation services. This minimal WordPress theme has an easy to use WordPress Customizer, a variety of personalization options, secure and clean code, a testimonial section, interactive user interface, etc. 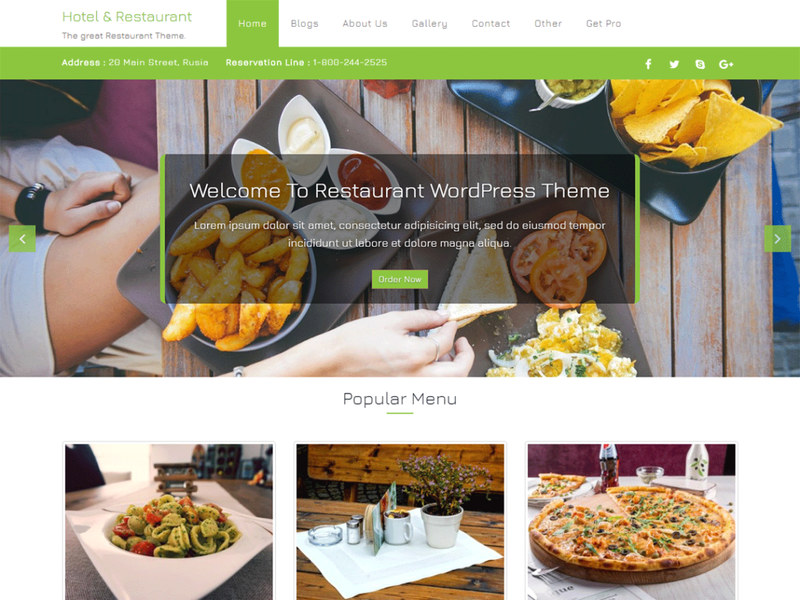 Hotel & Restaurant is a cool looking multipurpose WordPress theme well suited for many different websites including restaurants, cafeterias, bakeries, pizzerias and any other dining related site. 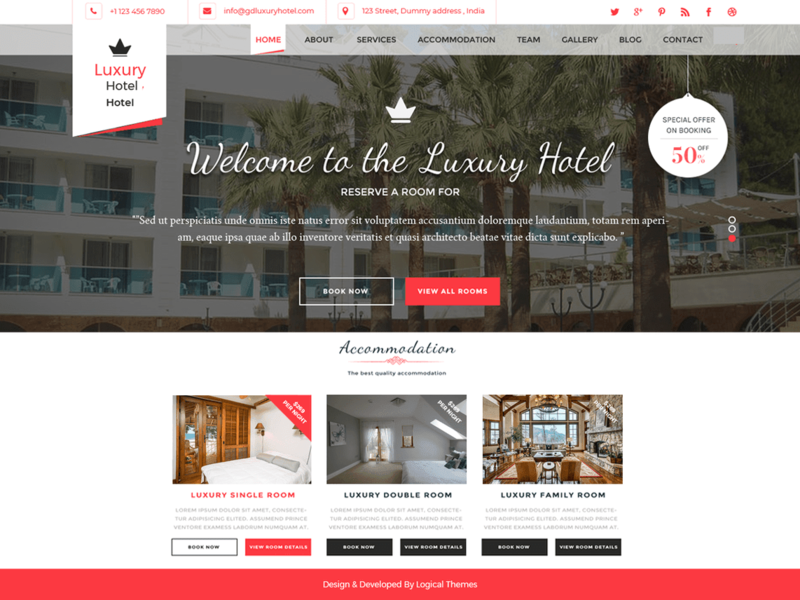 With Hotel Luxury’s beautiful design, and high coding quality, this theme can showcase your unique accommodations to the world and attract more visitors to your website. 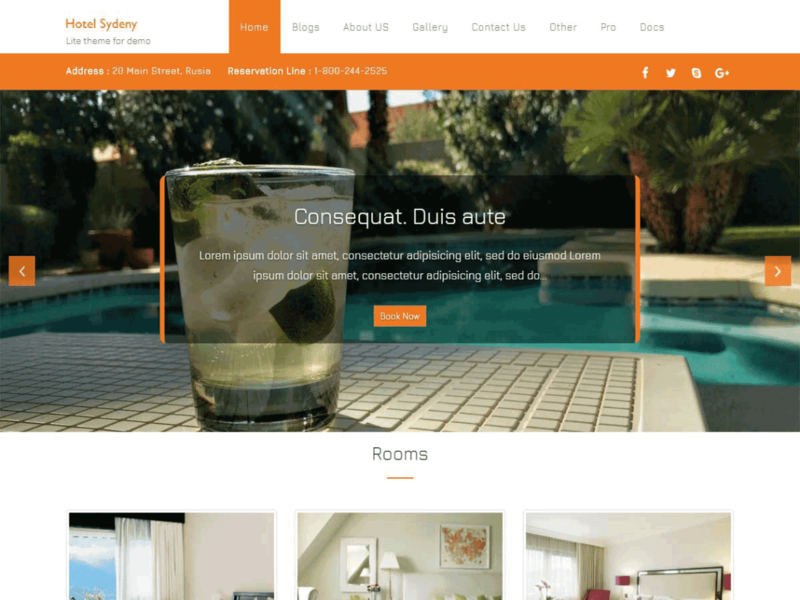 Free Hotel WordPress Theme. 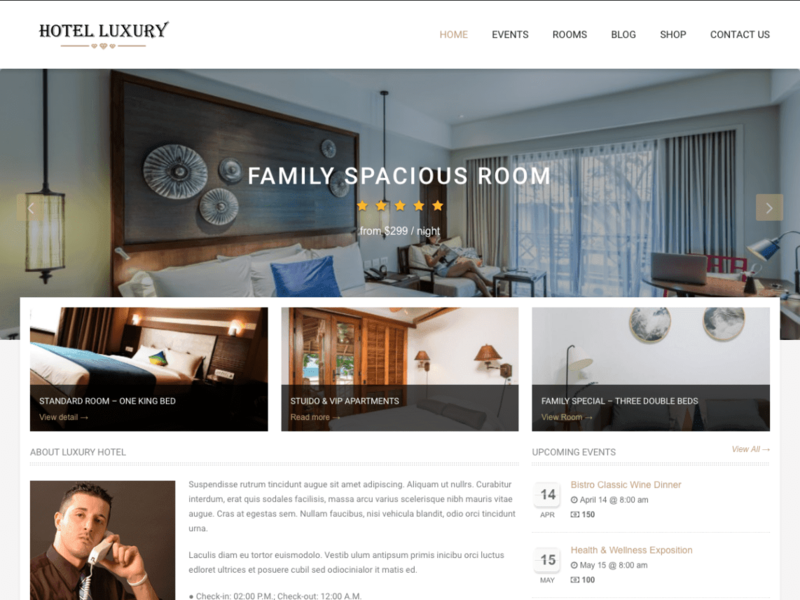 This smart and responsive WordPress theme that is suitable for hotel, resort, villas, holiday rentals, hospitality, business, restaurant, eatery, cuisine, cafe, lodge, etc. Hotel Sydney is a mobile friendly and has a very nice animated homepage. It is easily to setup and customize using Customizer API. Hi, Thanks! I tried to download the holiday crown template, but the download button links to monkeydigital. Is it ok? So sorry for that. We just made the correction to it. Hello I want to know why flashes the text of footer? May be the browser was not supporting the text. You may change the text if you want. Hi @ferisanjaya:disqus this is just a static version. We do not have database for this. Can You please provide me HTML version of this template. Its a static file itself just used PHP extension for including header and footer. Can i use this template ? Sure you may download the template. You need to upgrade your membership to premium @ $14 a year. Yeap i will upgrade it, it is a very good price. ! Sure @bmoviestgamsbmoviestgams:disqus. Looking forward to serve you. You need to upgrade your membership to premium @ $14 a year to download this premium theme. hi, I’m premium member, I paid a subscription, but in the last month I sent a few messages asking for support and still did not get an answer. I tried to install this template on my WordPress website as a theme, but it does not work in a standard way. I expect you provide some instruction or guide how to easily install this bootstrap template to WordPress. I’m waiting for your answer, thanks in advance for your help. We have replied to your message. This theme is not wordpress, there is no where mention that we have made this for wordpress. This is standard HTML theme that you will have to code. hi, thanks for your reply. I did not get any mail from you before. I understand, that it is not possible to import these files as a template for WordPress? So what do you mean: Fully customizable for all kind of CMS? We will try our best to get it done. I know this is an old post, but in order to be clear enough Bootstratp has nothing to do with Wordpres. Is not a CMS. I hate companies which fish for new members by false marketing. You guys are marketing this theme as Free on other forums and lists. And then you get people to sign up to download and then it says premium, just freaking great. what a waste of time and I must say, this unethical way of trying to get clients is immoral and I refrain from using such websites. Hence, even if I ever want a theme desperately I will not be purchasing your membership out of principal. Good Night and Good Luck. Initially all our themes were available for free and it got featured in many blogs. Since last 3 months we have change few of our themes to Premium so that we can continue our good works. Those themes are featured in many blogs still. We are thankful to them though. But sorry for your inconvenience. Google “Holiday Crown – Hotel Template” few is an understatement, if you decide to convert a theme into premium, you should have people go around changing the info! Can you send me link where you have upload this theme. We will have a look at it. Its working fine here. Can you give me screenshot of what is the problem showing in your. Thank you. I’ve noticed that on smaller screens that’s ok. My screens are 26 inches / 1920×1200 resolution. A Screenshoot annexed. Hi, there is already a realization that what the error misstatement is? So I can not use the template and would cancel the purchase. Thank you for a quick reply. We appreciate that you choose us. If you find difficulties in this theme then definitely we shall refund you. Thank you for looking after this theme. Yes this is premium theme and you will need to pay $20 per year. If you are a premium member we give support for a year and if you renew your membership you will get more support. The best pay is, you will also get chance to download other premium themes that we will be launching in near future. With $20 you get access to all other boostrap template as well. You can use image of bigger resolution, it wont be a problem but it might create problem with the loading. how much is the cost for a single site? Only 29$?